Yellowstone: Land to Life re-aired July 2015. People come to Yellowstone to visit the unusual thermal features and to view wildlife, often not realizing they are standing on one of the world's largest active volcanoes. In Yellowstone: Land to Life, environmental filmmaker John Grabowska (Ribbon of Sand, Crown of the Continent) presents a lyrical interpretation of the sweeping geologic story of Yellowstone — from glaciation, to mountain building, to formation of a supervolcano's gigantic caldera. Yellowstone sits atop a "hot spot" where the earth's crust is thin, and where molten magma rises relatively close to the surface. Past volcanic eruptions were among the largest and most powerful that have ever occurred on earth — indeed, one colossal eruption at Yellowstone vaporized an entire mountain range. Yellowstone's volcano, still active, has created the more than ten thousand geothermal features, the "curiosities and wonders" that led to the creation of Yellowstone as a national park in 1872. The park has more active geysers, hot springs, mudpots and fumaroles than the rest of the world combined. Their scalding-hot waters provide habitat for thermophilic (heat-loving) microbial life, simple organisms believed to be similar to the first forms of life on Earth. But there is a geologic story even older than that of the supercaldera. Andesitic volcanoes rose east of where the caldera lies, creating mountains now known as the Absaroka Range. Long before the caldera eruptions, mighty glaciers buried Yellowstone under 4,000 feet of ice, and plowed U-shaped valleys that are still readily identified as glacier-carved. Even earlier, an ancient inland sea lapped over the land that would one day be called Yellowstone. It is this broader geologic story in Yellowstone: Land to Life. Yet as fascinating as the geology can be, charismatic wildlife also brings visitors to Yellowstone. 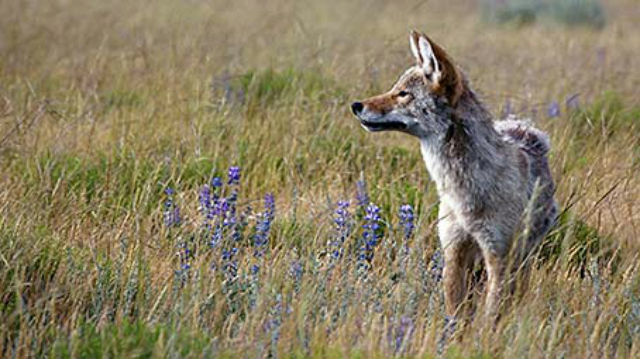 The park is considered the finest place to watch wildlife in the continental United States. It features more than 60 species of mammals, including gray wolves and grizzly bears, as well as American bison, black bear, elk (wapiti), pine marten and several bird species. This functioning natural ecosystem makes Yellowstone a living laboratory for scientist and visitor alike. And therein lies its importance, for Yellowstone is much more than a collection of "curiosities and wonders," more than beautiful scenery. Yellowstone is an international symbol of preservation, an American cultural icon, and a place of pilgrimage for generations of visitors. Featuring breathtaking cinematography of a complex and charismatic landscape, Yellowstone: Land to Life was filmed over two years during all four seasons. The film delves into the significance behind the scenery. Illuminating the intimate bonds between the landscape and biology is key to the story, showing how Yellowstone's geology influences where life exists and how it evolves. The film contemplates the human connection as well — humankind's relationship to Yellowstone, the world's first and most famous national park. Special thanks to the Yellowstone Association for their support of this effort. Yellowstone: Land to Life was produced by John Grabowska. See exclusive content about the world's first national park. Plan your visit to Yellowstone National Park. Study the latest science at the Greater Yellowstone Science Learning Center. Watch a live webcam of Yellowstone National Park. Will the Yellowstone volcano erupt again? Get the answers. Tour geyser basins at the Old Faithful Virtual Visitor Center. © 2015 Idaho Public Television. All Rights Reserved. Photos courtesy of Hilary Grabowska.